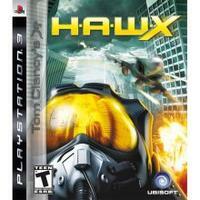 Taking off from a long line of successful first-person shooters, H.A.W.X is the first flight combat game from the tom Clancy interactive entertainment franchise. While realistic presentation in the game's graphics, audio, and speculative fiction plotline are central to the experience, the play of the game is available at two main levels of realism. By default, a built-in "Enhanced Reality System" serves as a sort of automated co-pilot, providing damage control, targeting, missile detection, squadron management, assistance with stabilization and handling of the aircraft, and similar functions. With the touch of a button, some or all of these auto-assist systems can be disabled, giving the player much more maneuverability and providing a more demanding, simulation-style experience. Tom Clancy's H.A.W.X is set in the same near-future reality as Ghost Recon Advanced Warfighter 2 and EndWar, and it takes place in the time between those other two other games. Private military corporations are brimming with money and power, as nations continue to rely on them more heavily for defense. The acronym in the game's title stands for "High Altitude Warfare, experimental squadron." Players take the role of an ace pilot named David Crinshaw who had flown support missions for Ghost Recon teams as part of the United States Air Force, before joining a powerful private military company. When Crinshaw's employers decide to attack the United States, he patriotically returns to his position with the Air Force to help defend the nation against the mercenaries.